When it comes to finding the perfect comforter you should look for one that will ensure a great night's rest. Comforters made with a Baffle Box Design keep you cradled in blissful comfort throughout the night without pesky cold spots. 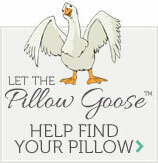 The Down Lite � White Goose Down Premium Baffle Box Comforter is full, lofty and ready to keep you comfortable. Filled with the finest down on the market, 100% white goose down, the Down Lite � White Goose Down Premium Baffle Box Comforter is light, lofty and extremely comfortable. It's time for you to start getting the kind of sleep you crave, order today and give yourself the gift of a great night's sleep.